This must be one of the most hotly-contested market segments in the country: Large SUV. 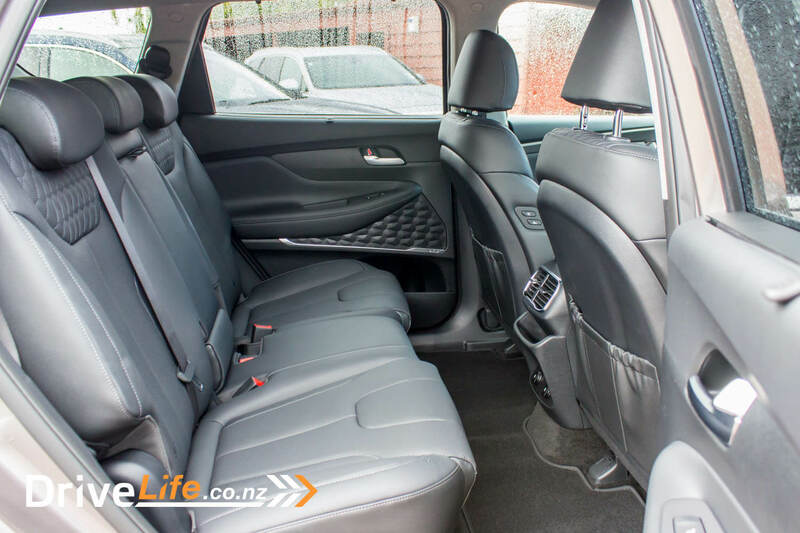 Not only that, but there are some stunningly well-designed cars in this segment – for example, the Mazda CX-9 and the Toyota Highlander – both stand proud as an excellent choice if you are looking for a 7-seater SUV. Then there’s the Hyundai Santa Fe – this car too has a loyal following, and those that own them, love them. This is dangerous territory – get it wrong, and when those loyal owners come to upgrade, they may look elsewhere. Has Hyundai got it right? We went to the launch to find out. The whole SUV market segment makes for interesting reading. By the numbers, YTD for 2018, Large SUVs make up 11.4%, then Small SUVs at 12.9% and Medium SUVs taking top spot at 16.5%. Utes make up the rest of the numbers (25%). The Santa Fe so far this year has lagged behind the leaders, with the Highlander, Captiva and Outback outselling it. Mind you, the Outback is only 40 or so units ahead, so it’s a close race for third spot. Even more interesting were the numbers over the last ten years. For the last decade in this segment, 67% have been business buyers, and 33% private – and that hasn’t changed. For Hyundai, they buck this trend with an almost even 50/50 split. No change too across powertrains, with 54% petrol and 46% diesel. What about 2WD/AWD? Same thing. 88% AWD, and 12% 2WD – for the last ten years. If only lotto numbers were that easy to predict. But some things have changed. Ten years ago, 7-seats made up 66% of the Large SUV market segment, while that number is now 80%. We must be having more kids, or something. For this reason, there’s no 5-seat option for the new Santa Fe – 7 seats only. The age of buyers has changed too, with the Over 40s outnumbering under 39 Year-Olds 3 to 1 in 2008. Now? 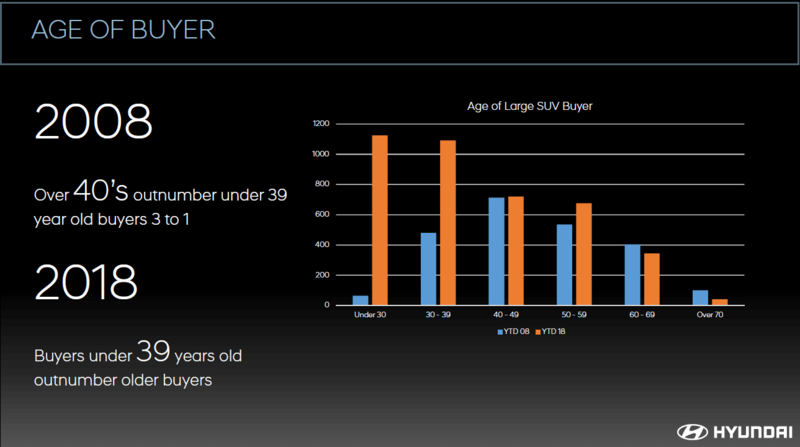 That’s almost reversed, with under 39 Year-Olds outnumbering ‘older’ buyers. 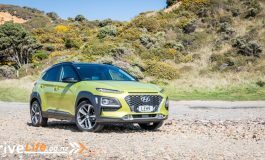 Hyundai also showed us some future releases, including an updated Tucson in Q4 of 2019, with updates in tech, design, safety and drivetrains. There’s a new i30N Fastback coming too – same powertrain as the i30N, but with a fastback body. Hyundai NZ is undecided if they will bring this car here, or not. In 2019, Hyundai will release a Fuel Cell Electric Truck, with a 400km laden range – that’s pretty impressive. 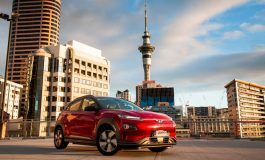 Apparently there’s a hydrogen station going in in Auckland shortly, and this will help drive demand for the truck. 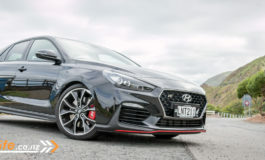 Like other manufacturers, Hyundai are getting into the Connected Services market, with an app to control different aspects of your car. The new Santa Fe will feature AutoLink Bluetooth and AutoLink Premium, which allows for things like accident assist, emergency assist, driving stats, geo fencing, roadside assist, driving history, vehicle health reports, recalls, service bookings and estimates, also fuel level and efficiency. The Bluetooth version is standard in the Entry and Elite models, while the Limited has the Premium version. If you have the Premium version, it means the car is fitted with a SIM card, and you can remote control certain aspects of the car from anywhere. These include remote start, remote AC set etc. The Bluetooth version does not allow for any remote features – but the Premium option is available on the Entry and Elite models. For Premium, this is a free service for the warranty period of vehicle. 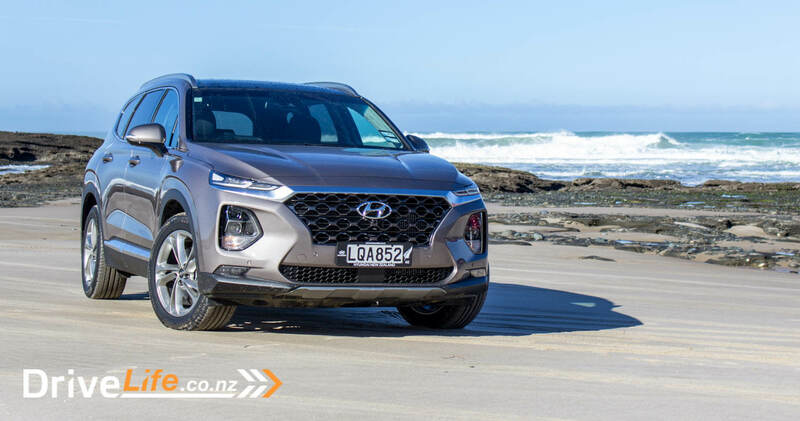 Gavin Young, Service Manager for Hyundai New Zealand, was next up to explain more around the design and features of the new model. It does look a little Kona-ish at the front he says, and this is by design. There are projection headlights across the range, and side on there is a longer wheelbase (by 65mm), it’s longer overall, and the rear of the car contains “more design cues from Kona”. Still at the rear, there are lower placed indicators and reversing lights. Wheel-wise, there are 18” alloys on the Entry level car, and 19” on other two models. On the inside, apparently there are lots of soft touch materials, and the rear (third) row window is a lot deeper than the previous version, with visibility up 41% for third row passengers. The car is also higher and wider than the outgoing model, with a slight Increase in boot space, at 130/547/1625 litres. The tow rating is unchanged at 750 unbraked/2000 braked kg. There’s been lots of NVH improvements he says, but only a drive will prove if this is true. For the powertrains, the existing 2.4 Theta II GDi petrol engine is retained, making the same 138kW of power and 241Nm of torque. Petrol versions of the Santa Fe are fitted with the same 6-speed auto as the current model, and it returns 9.3L/100km in fuel economy. The new 2.2-litre diesel sounds like where it’s at, with an 8-speed auto, and 147kW/440Nm. This engine should give you 7.5L/100km. There are some drive modes for us to play with today, which include Eco, Comfort, Sport and Smart. Eco sends most of the drive to the front (90%), while Sport will send more to the rear (only 60% front). 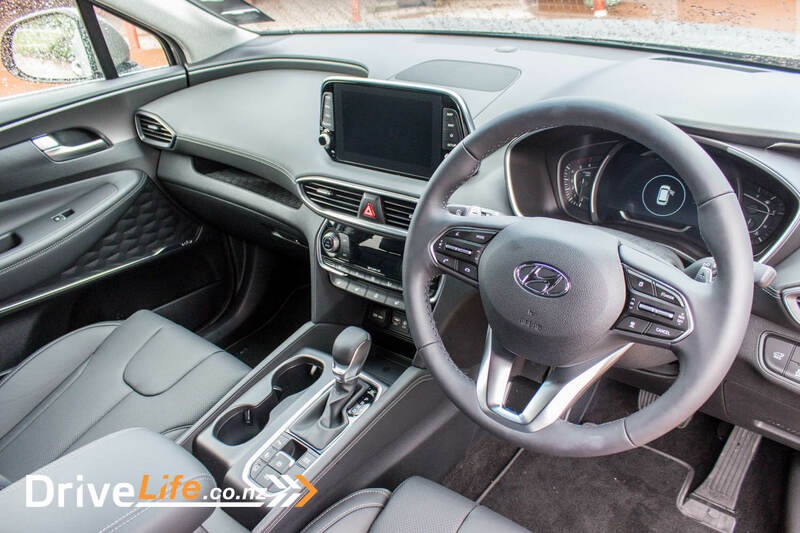 The new Santa Fe spent lots of time and thousands of kilometres in Australia, being tuned in the suspension and steering department, and Gavin went on to point out that the different powertrains have different suspension settings. There is no ANCAP rating for the car just yet. SmartSense makes an appearance in the new Santa Fe, after its debut in the Kona EV. This includes things like Rear Cross Traffic Alert (RCTA) and on top of that, RCTA Assist, where the car will stop you changing lanes if there is another vehicle there. There’s also Lane Keep Assist, Lane Departure Warning, adaptive cruise control (with stop and go ability), Leading Vehicle Departure Alert, Driver Attention Warning, Forward Collision Avoidance Assist (which also identifies cyclists), high beam assist, Safe Exit Assist (where the SmartSense system will not allow rear door lock to unlock if there is a car coming, saves kids getting run over), and a new one I hadn’t seen before – Rear Occupant Alert. This system is for animals or children who get left in car unknowingly. The first thing it will do is give you an alert on the instrument cluster, then will sound horn if left behind and car locked. It’s a great safety feature. The base (Entry) model has most of the safety features of SmartSense, except RCTA Assist, Blind Spot Collision Assist, Safe Exit, and Rear Occupancy Alert. There is a heads-up display in the new Santa Fe, but it’s only on the Limited model. There are many features available in the range, like heated and vented front seats, heated wheel, heated second row seats, and Qi wireless phone charging. Day One would see us driving north from Auckland up to the Hokianga. Our Santa Fe for this day would be an Elite model, in the Stormy Seas colour – a nice, deep metallic blue. 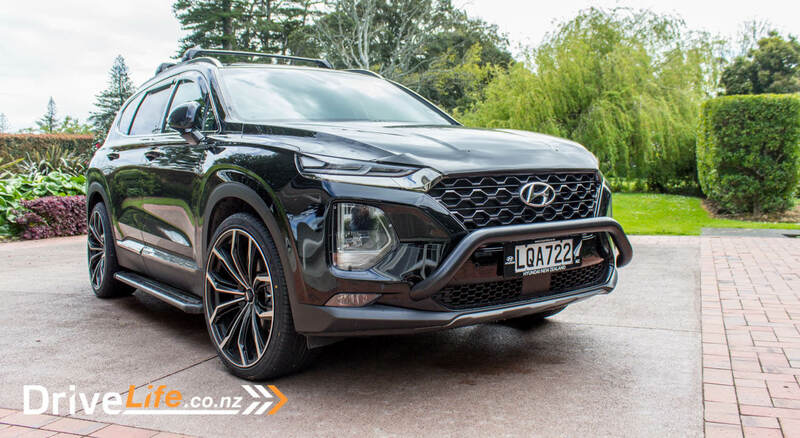 This would be a diesel model – actually, Hyundai NZ only brought diesel cars for us to drive, and no Entry model: only the mid-spec Elite and the top-spec Limited. I jumped in as passenger first, and immediately you can see some changes – the textures and fabrics used inside the cabin are a big change from the previous model. There’s also the ‘knit’ headlining, which looks and feels great. The build quality is as always, top of the class. We hit the motorway, and found almost no wind noise at all. There’s some from the mirrors, but you have to listen hard to pick it up. General NVH is superb, with only the tyres letting the side down, when they are on coarse-chip seal. However, the same can be said for most cars on that type of road. The new Santa Fe reminds me of that benchmark in NVH, the Mazda CX-9. It really is excellent. The central display is extremely high definition, noticeably above others in this segment. Crystal clear and simple to use. We did a driver swap, so I got my first taste of the new car. That new 8-speed auto is a real gem – perfect changes at the right time. We took the road from Dargaville to Opononi, and those that know that road will know just how bumpy it is. The Santa Fe took these bumps – many mid-corner – in its stride, and the chassis is a highlight of the new model. It actually handles quite well, and the ride is bordering on outstanding. That road is a pig for bumps, but they didn’t unsettle the Santa Fe in the slightest. The 440Nm of torque from that diesel engine was put to great use, punching the car out of the corners. Midrange performance is great, but it felt like it was running out of steam closer to the maximum RPM for peak torque. Dinner that night was at the Copthorne on the Hokianga, which was a great location for a photo opportunity, as the sun went down. Hyundai NZ Ambassador, Sir Graeme Henry was on hand to regale us both with funny and uplifting rugby stories, and to try and get us all to buy a Hyundai. Something we haven’t covered yet is the look of the new car – it’s one of those cars that look as good in the flesh as they do in photos. Yes, there’s hints of the Kona at the front and back, but that’s no bad thing; there aren’t many people who don’t like the look of the Kona. Today we’d be moving up to the Limited model, so vented seats, a panoramic sunroof, a heads-up display, and the active dashboard. This was finished in…Stormy Seas. Yes, the same colour as the Elite model. Interesting that other than the wheels, it’s almost impossible to pick the difference externally between the two models. There’s also the 360-degree view camera in the Limited model, great for parking, although it has auto-parking anyway. We headed out of the hotel and drove for a few minutes, then off-road onto some farm land and then onto the beach. A great bit of fun, it’s always great to drive on the beach. After a few photos, it was time to head back to the road, now driving up a smallish sand dune to get there. The first cars were fine, but after than the ruts were too deep for the tail-enders. There was some minor damage done, as cars had to be driven at speed up and onto firmer ground. Other than loss of mana, no real problems. We left our off-roading area, and headed to Kawakawa for a coffee break. I was driving again now, and this car – only a two-day drive so far – impresses with its overall refinement. It’s quiet, easy to drive, great visibility, excellent handling…so far it’s ticking all the boxes. From Kawakawa, we drove to Mangawhai Heads, and Te Whai Bay Wines for lunch. This was a great drive, heading inland at Waipu and taking the coast road. A lot of fun, and again the Santa Fe impresses with chassis dynamics. All too soon we were back in Auckland. The car we had for day two had averaged 7.9L/100km for fuel economy over the two days, and after a reset at Te Whai Bay Wines, it averaged 6.8L/100km on the slower drive back to Auckland. These figures seem to be inline with Hyundai’s claims, but most of this was on open road. So what next? We wait for a test car, and spend a week with it. Hopefully it’s as good as it was for our launch. 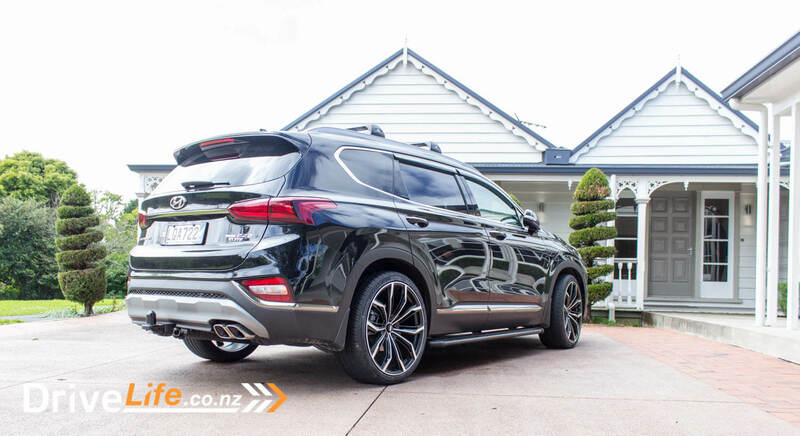 If it is, then there are some large SUVs out there that should be worried – this is a very refined, lage SUV. 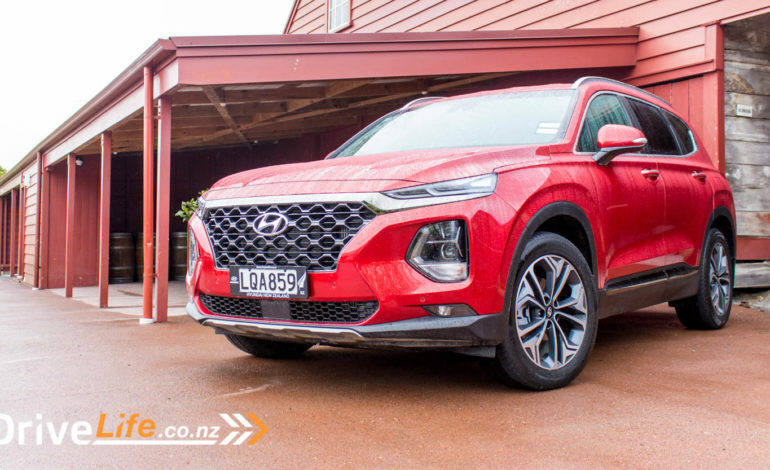 It may only be the pricing that Hyundai NZ struggles with.